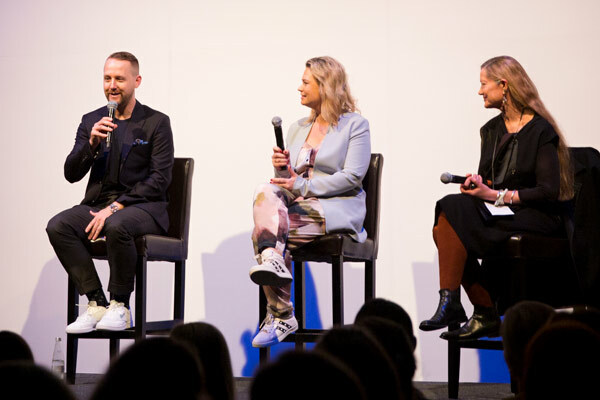 The last day of Mercedes-Benz Fashion Week Australia arrived all too quickly, with another full day of shows to finish off a busy week of brilliant fashion. 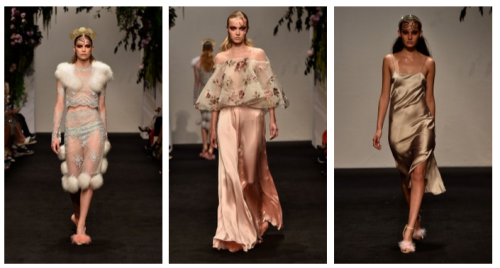 Always a highlight on the fashion week calendar, Romance Was Born are one of the most creative brands in Australia, consistently creating vibrant runway shows teaming with whimsical ideas. This year the designer duo of Anna Plunkett and Luke Sales presented another colourful fashion fantasy transforming the Art Gallery of New South Wales into a magical garden for their models to play in. Their collection was a tribute to Australiana, in particular the work of artist and designer Linda Jackson with a series of avant garde creations in rainbow brights and so much embellishment that the outfits can only be described as wearable art. One of the most exciting things about the New Generation show is seeing a fresh crop of designers bring their ideas and creativity to the runway. This year’s group definitely brought their A game with Marriam Seddiq up first and showing her tribal flare with clever eveningwear. Cute and quirky, Casper & Pearl presented romantic pieces featuring pretty prints. House of Cannon’s silk dresses in digital prints showcased their Chinese inspiration while Misha Collection showed a modern range of draped styles with knot details. Pol went for a contemporary approach with subtle prints inspired by Palm Springs. Vanessa Moe’s sophisticated eveningwear reflected her deep sea inspiration and attention to detail. 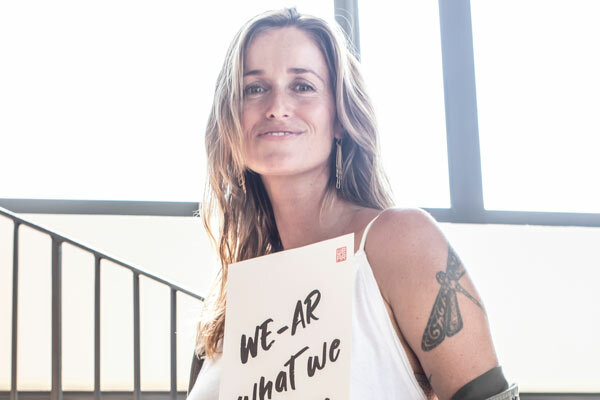 Kirrily Johnston made a welcome return to the fashion week runway at the helm of the new CS Edit X Kirrily Johnston which is a collaboration between the acclaimed designer and high street label Cooper Street. The collection was full of contemporary pieces with a young, feminine feel and featured tiered ruffles, pretty floral lace and abstract prints on a range of playful dresses, sheer skirts and high-necked tops. In their first solo show after their MBFWA debut last year, Dyspnea took to the runway with a fanciful collection full of fun pieces covered in furry pompoms. Baby pinks, ivory and gold dominated their whimsical looks, aided by pretty rose prints, delicate lace and beautiful embroidery. 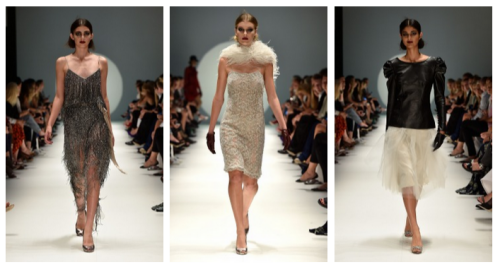 Their look was feminine and playful with a charming feminine feel. Although the crazy pompom pieces were eye-catching it was the delightful brocade garments, in particular a winsome golden coat which were the most covetable pieces. Empty the pool they said – and so they did! Ten Pieces took the fashion set to Bondi’s iconic Icebergs where they had drained the pool to create a runway quite unlike any other seen at fashion week; it was certainly one of the best places to be on a warm Sydney day too. 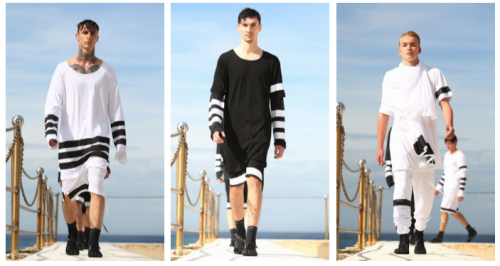 The unisex collection in ever-popular black and white featured relaxed t-shirting, dresses, loose shorts and pants with bold stripes. It was super-wearable streetwear with a nonchalant feel emphasised by the casually draped scarves and hoodies. 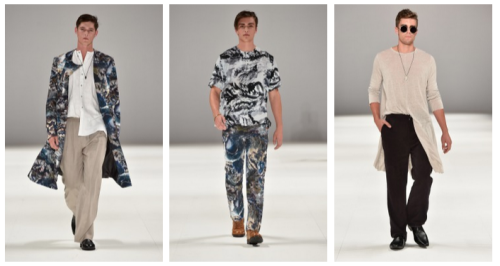 Raffles International Showcase presented their six top design graduates work from both Sydney and Singapore. The show opened with Sara Aljaism who presented beautiful evening wear with delicate beading. She was followed by Cynthia Fransisca who went for a seventies feel with lots of wide-legged pants and gorgeous black rose embellishments. Next up was De La Motte who presented a cool menswear collection of casual pieces in simple silhouettes with a vintage feel. 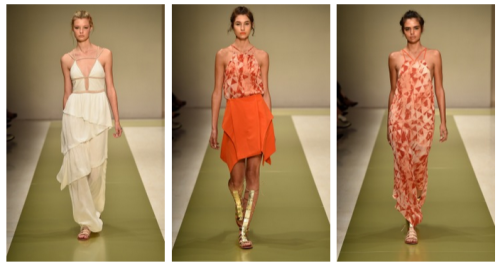 580’s Asian inspired collection followed with an interesting juxtaposition between light neutral pieces and super brights. Iven Teh was a favourite for his clever interpretations of eveningwear with over-sized capes and a short-style tuxedo. 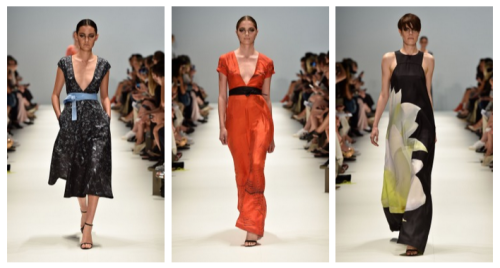 Asanovski went for elegant cuts and sophisticated tailoring to create form-fitting womenswear. Lastly, Any Step presented an eclectic collection featuring harnesses, spikes and woven leather for looks that had lots of attitude. Braun presented 3UP, a collection of three labels from emerging designers who are also being promoted by the housewares brand. First up was Black by Geng who chose a utilitarian approach for their daywear with trenches and coats in neutrals with splashes of cobalt and orange complemented by fitted monochromatic evening wear. Next was Injury who showed playful designs with a swirl motif, they also used an abstract splatter print on their mens and womenswear with bombers and layered blacks. Finishing up the show was Backstage, who went for a nineties look with crop tops, fluted sleeves and fringing. Their off the shoulder tops and cowl neck draping added to the retro feel. Betty Tran brought a dramatic dose of glamour to the runway with a striking show that was a touching tribute to her mother. 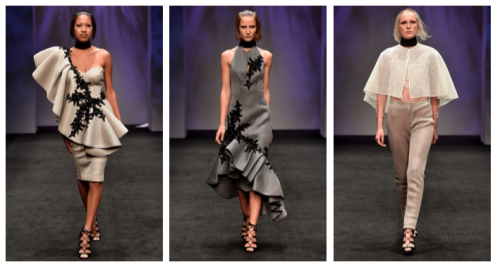 In her second MBFWA showing, Tran presented a winsome collection of gorgeous gowns and superb separates in crimson, white, grey and black with beautiful black applique and sparkling embellishments. 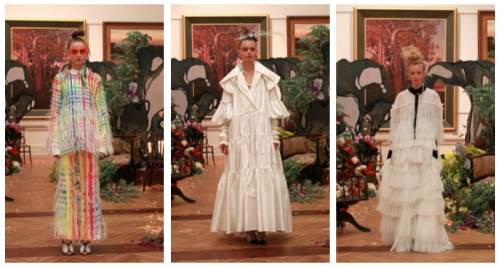 The garments were cleverly structured with over-sized ruffles, plunging necklines and sculptural shapes making for a particularly eye-catching range. The look was strong, feminine and elegant with the closing outfit an exquisite bridal gown in scarlet completed by a flowing white train covered in amazing red floral lace. Gail Sorronda celebrated her tenth year in the fashion industry with a fascinating show which was also a nod back to her earliest collections. A circle theme was present throughout the collection from the opening white outfit which featured a circular motif, to the models circular head pieces and the lit white orb hanging on the runway. 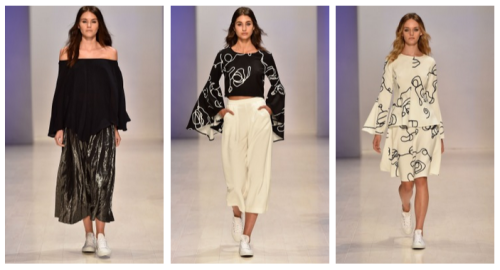 As is Sorronda’s signature, the looks were romantic with unusual silhouettes and she continued to play with the circle idea with billowing rounded sleeves and skirts in white and black. 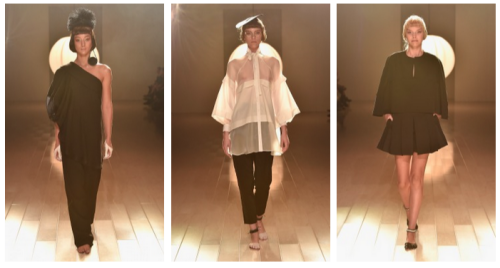 Her collection was given a scholarly feel with capes resembling graduation gowns, prim collars and round spectacles which enhanced the unique retro aesthetic. Johanna Johnson closed MBFWA 2015 in show-stopping style with a huge production showcasing her latest evening wear collection. It was a glamorous presentation heavy on embellishments as models clad in glittering outfits with a twenties theme graced the runway. Beaded fringing, sensuous silks and floral lace featuring on beautiful form-flattering gowns, flowing skirts and carefully draped tops in hues of gold, crimson, silver, grey, cream, black and burgundy. The outfits were perfectly complemented by maroon lips, smoky eyes and sweet vintage-inspired hats. 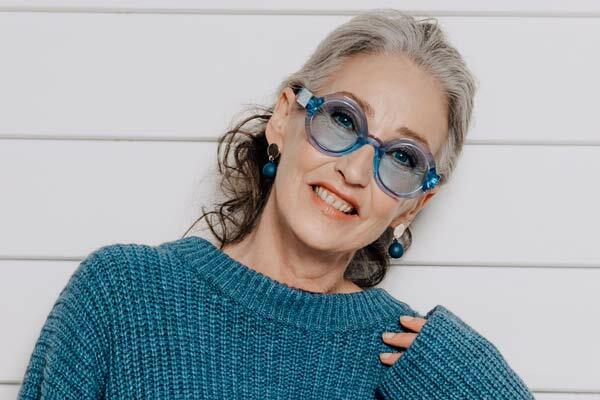 It was a fabulously fitting end to a week of wonderful fashion and we definitely have much to look forward to when this week’s garments start appearing in the shops for the summer season later in the year.